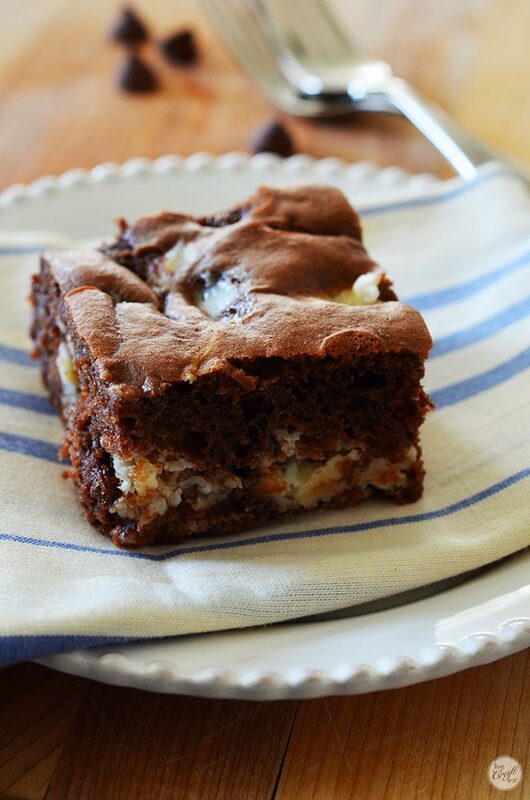 You are here: Home / Eat / chocolate cream cheese cake bars to die for! 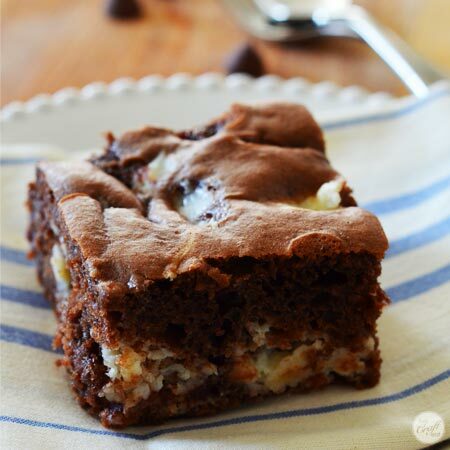 chocolate cream cheese cake bars to die for! i know i’m not the only one who needs a chocolate fix from time to time, but i don’t often have chocolate in my house aside from chocolate chips and cocoa powder. call me crazy, but the chocolate that i love can get expensive after a while and since i don’t need the temptation staring me in the face all day long i just don’t buy it. it’s hard to practice self control! but oh boy, when those chocolate cravings come it makes me want to run to the store and buy out the candy aisle! so as a nice compromise with myself i make sure i have 4 simple ingredients in my pantry and fridge so that when those cravings do hit, as they are prone to do, i can make these amazing marbled chocolate cream cheese cake bars. and the bonus is that my kids love to help me make and eat them too so everyone wins! like i said, this recipe is super simple and uses only 4 ingredients! all of them are pantry/refrigerator staples in my house. the first is boxed chocolate cake mix. you can use whatever boxed chocolate cake mix you want, but german chocolate is my favorite for these bars. *note: you’ll also need the eggs, oil, and water that are called for to make the box’s mix. the second ingredient is chocolate chips. i stock up when they go on sale around the holidays, so i probably have too much of these, but this is a great way to use them up! the next thing is sugar, which is always, always in my pantry. this gets mixed in with the 4th ingredient, which is the only refrigerated ingredient (but it lasts a while in there), a bar of cream cheese. first things first: prepare the cake batter according to the package directions on the box. 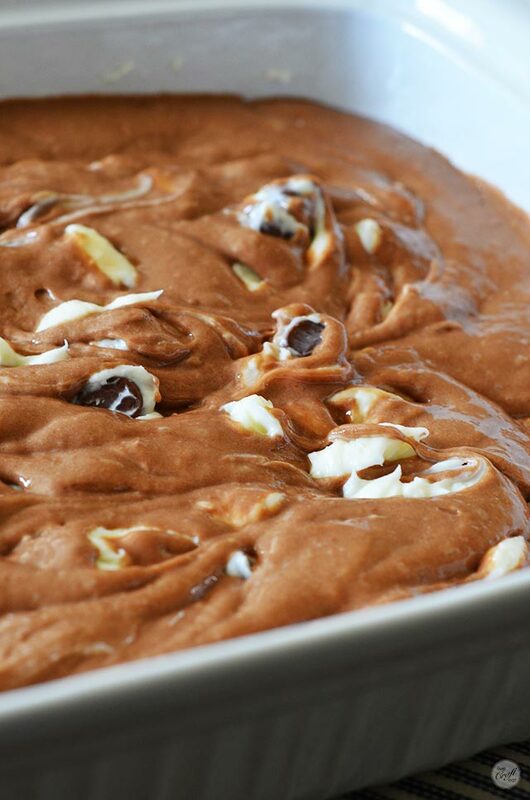 once the batter is ready, pour it into a greased 9″x13″ baking dish and set it aside. next, cream together the softened cream cheese and the sugar until it is light and fluffy and the sugar is well incorporated. this is a heavenly mixture. 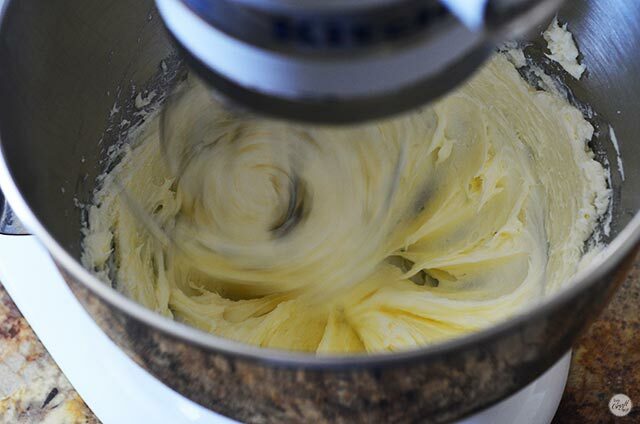 …then dot the top of the cake batter with teaspoonfuls of the cream cheese. use the tip of a sharp knife to cut through the cream cheese dollops to get a marbled/swirled effect. i am the very first to admit that i am no good at doing this and making it look good! maybe i don’t have a gentle hand or something, but for whatever reason, i am incapable. but no matter! everything is still there and it still tastes amazing! my saving grace is that now i get to sprinkle the rest of the chocolate chips over top of the whole thing, so hopefully no one will notice my poor attempt at marbling the cream cheese and chocolate cake batter. 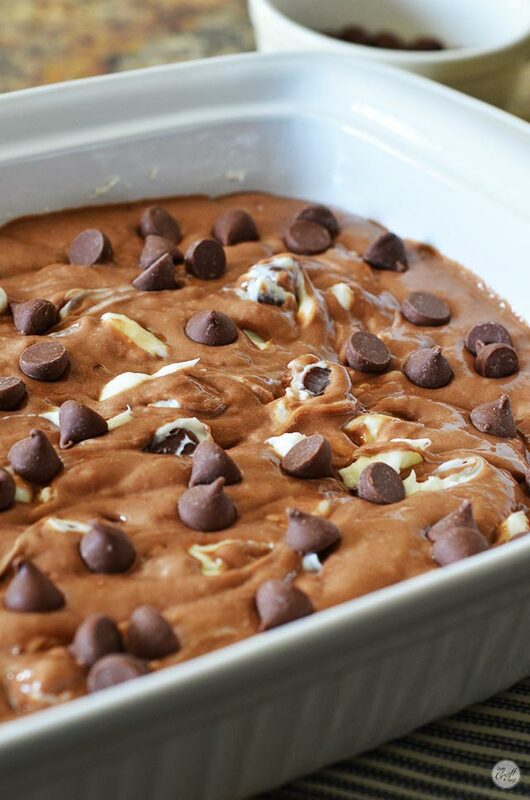 bake these off in the oven, let them cool, and cut into squares! they are light and fluffy and cakey with surprise bites of that sweetened cream cheese mixture…i totally want to make these again right now! but best of all, they totally and completely fill that chocolate craving! 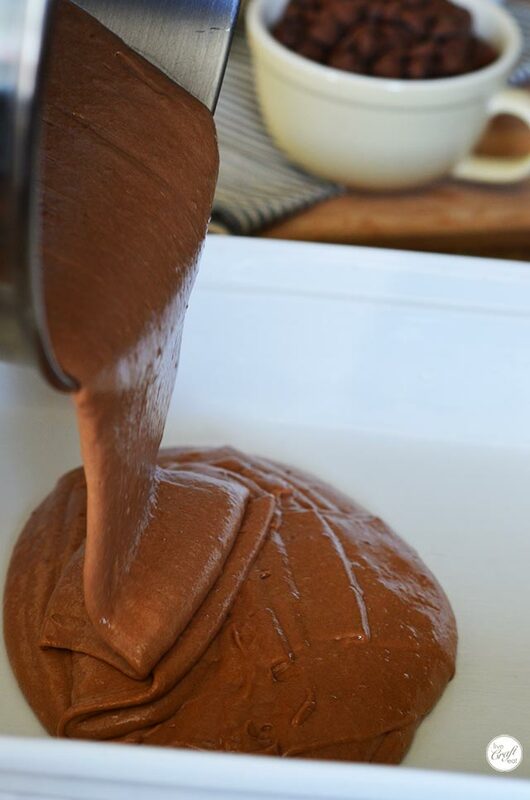 here’s the easy recipe so you can get your chocolate fill today! prepare the chocolate cake mix according to the package directions. 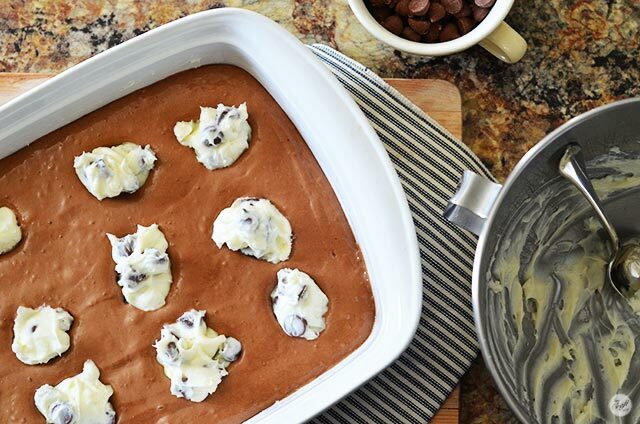 pour the cake batter into a buttered 9"x13" baking pan. beat the cream cheese and sugar together until light and fluffy. 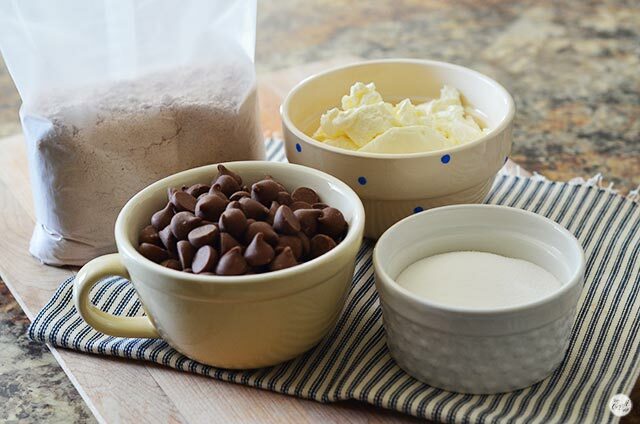 by hand, stir in ¼ cup of the chocolate chips. drop cream cheese mixture by the teaspoonful over the batter. cut through the cream cheese dollops with the tip of a sharp knife or a toothpick to swirl the mixture into the cake batter. 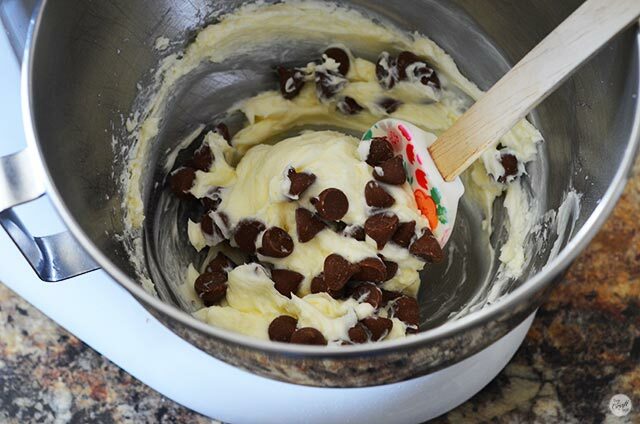 sprinkle the remaining chocolate chips over the top of the marbled cake batter. bake at 350 for 35-38 minutes or until a toothpick inserted near the center comes out clean. let cool completely and cut into bars. « white chocolate m&m popcorn :: friday night movie snack! If you don’t align your dallops of cream cheese mixture but instead off center them you will find it easier to marble. But I absolutely love this recipe always a big hit. The only different thing I do is put pecans on top instead of chocolate chips. Great suggestions, Crystal – thank you! I will try staggering the cream cheese mixture a bit better and put pecans on top. Can’t wait to try it! I didn’t have a cake mix or chocolate chips. So, I used a brownie mix. In my creme cheese mixture, I had some leftover Snickers from Halloween. I sliced them thin and mixed with creme cheese. I’m curious to see how it turns out. Smells so good…. We’ll see! Does this need refrigerated after cooling?